Do you know of a member that is actively involved in fundraising activities or educating others about the Daughters of the Nile Foundation or have contributed to the Foundation and should be recognized? The Daughters of the Nile Foundation is extremely grateful for these contributions to help us in our mission of helping children. Nominations are now being accepted for the McHenry Awards. 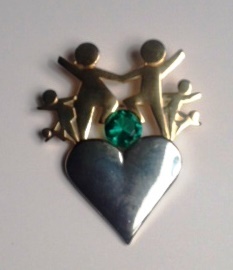 They will receive a Pyramid of Commitment, including a gold heart/ children pin embellished with a green stone only made for the McHenry Award winners. These awards are made possible by a generous gift from the law partners of McHenry Haszard Law in Lincoln, Nebraska. All members of Daughters of the Nile join the Foundation Board of Directors in thanking the McHenrys and the partners of McHenry Haszard Law. To nominate an individual for one of these prestigious awards, please submit a written description of the member’s qualifications with regard to the criteria listed below. The deadline for submitting nominations is April 30, 2019. 1. Recipients must be a Lady of the Household (she may have held an office in the Subordinate Temple). 3. Submit nomination of individual(s) with detail of contributions by individual for vote by the Board. 4. Nominations shall be submitted no later than April 30, 2019.